Dodging a Bullet… or a Tree! Those of you outside of the Pacific Northwest probably heard about our latest weather woes on the news. Those of you in Northwest Washington might not have power to read this! We experienced a very strong wind and rain storm, knocking down trees and knocking out power to thousands. Jon had the weekend off, so we decided to take an impromptu wine tasting trip to Walla Walla. Saturday afternoon, while sitting on a Walla Walla winery patio enjoying our first tasting in the sunshine, I received a phone call from our neighbor. She heard a very loud crash at our house and thought she heard glass breaking. She was too afraid to go outside to check it out. Oh boy… My parents were kind enough to venture over to our house to see how much damage there was. I was on pins and needles for the next half hour. 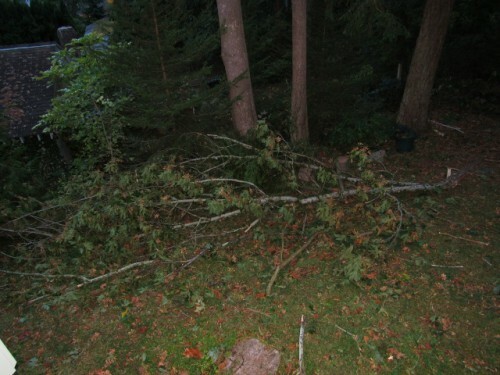 Luckily, we dodged a huge bullet, or rather huge branches from two of the maple trees in our yard. 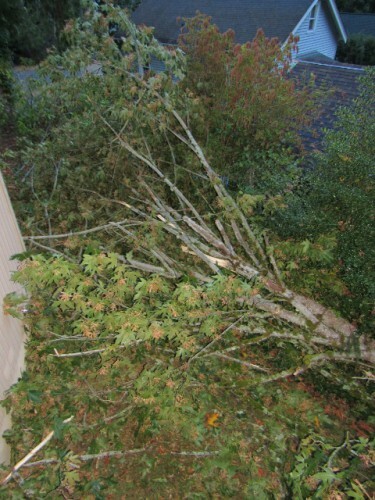 One big branch is about 8 inches in diameter and about 25 feet long. The other is basically two thirds of the crown of the tree. A trunk that is 12-15 inches in diameter, with multiple branches. The larger branch is about 40 feet long. The small branch lying in the yard. One of the branches might have hit the roof, and then slid off – as there are some minor scrapes to the siding of the house. But fortunately, there doesn’t seem to be any damage to the roof or the deck. And no broken windows! The bad news is that we’ll have hours of clean up in front of us. I guess I know what I’ll be doing on the Labor Day long weekend! And I promise I’ll blog about the more enjoyable parts of our weekend soon! Last year, we had such a wonderful time on our Rogue River, Oregon trip with Jon’s parents that we talked of doing it again. But like any good trip, I always struggle with the decision to return to the same place, or try something new. We talked with Jon’s parents about perhaps visiting Bend, Oregon, but some research revealed very high prices for mid-summer stays. Meanwhile, Jon and I talked about visiting Rocky Mountain National Park, and doing a broader Colorado loop. We asked his parents if they wanted to join us, and well, you can guess what they said. Colorado has several National Parks, and several more National Monuments and other park service sites. Jon wanted to see Pike’s Peak (what he thought at the time was the tallest peak in Colorado). 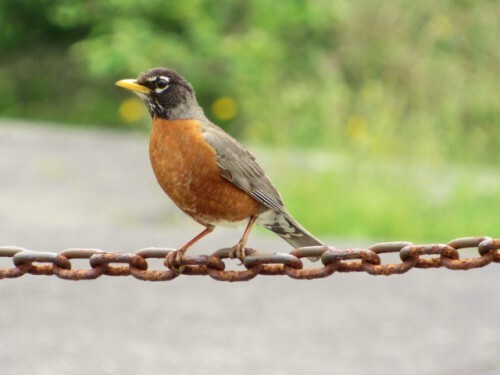 Linda and Robby just wanted to do whatever we did, but if at all possible, Linda wanted to see Leadville, the country’s highest incorporated city, and take a scenic tourist train ride there. We already had some lofty visions for the trip; Colorado is a big state and these were some big driving distances. I checked to make sure that everybody would be ok with the driving, and making camp in a new hotel every night. Then I mapped. In the planning phases, Jon started talking about how close Moab, Utah is, but really, we can’t go to Moab every time! What do you want to not do, in order to go back to Moab? Scratched… I wanted to see Dinosaur National Monument, but it was about 2.5 hours north of Grand Junction, and would require a whole day for the detour, so it got disappointingly scratched from the list too. 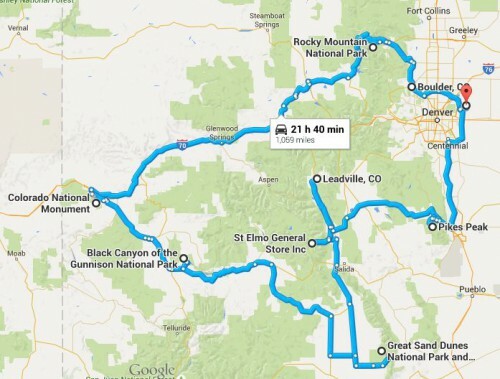 The route would include Rocky Mountain National Park, Colorado National Monument, Black Canyon of the Gunnison National Park (somehow fondly renamed by Jon – Gunnison of the Bay), Great Sand Dunes National Park, the St. Elmo ghost town, Leadville, CO, Florissant Fossil Beds National Monument and Pike’s Peak. What a whirlwind in 7.5 days! I found this bottle on the bottom shelf of the wine fridge yesterday. I don’t remember ever having seen it before. My mom recently brought me some Michigan wine, but this isn’t from Michigan, so I don’t think that’s it. 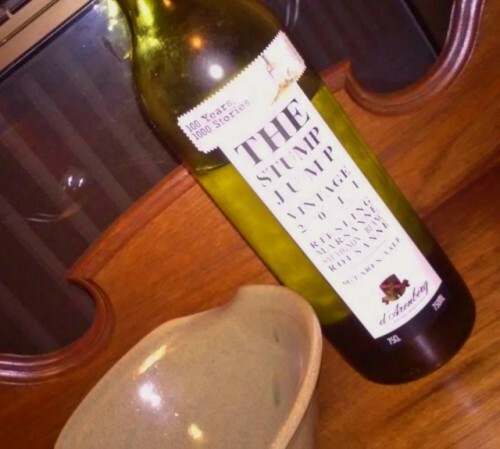 It is the D’Arenberg The Stump Jump White 2011, a South Australian wine. It is a blend of Riesling, Marsanne, Sauvignon Blanc and Rousanne. It is only a 12 bottle wine fridge, and I rummage around in there quite often, taking bottles out to drink and putting new ones in. It isn’t like a bottle is likely to get lost in there. It is a 2011, so it’s likely I’ve had it for awhile… Maybe Jon found this one on the rack in the pantry and put it in there, but it wasn’t dusty, and most of those bottles are dusty. Jon isn’t likely to wipe or rinse a bottle… So, I’m confused. I suppose I might have picked it up at the grocery store on one of those nights we stopped by on the way home from doing wound care with my horse. Those were long, tiring days… But surely it is a better story that that! I popped open this alien-delivered bottle to find a nose of lemongrass, and flavors of pineapple and lemongrass. It has an initial taste of butter on the tongue, giving way to a mild acidity at the back of the palate. A great summer sipper to pair with lazy summer weekends inside (because it is too smoky outside from the wildfires east of the mountains), folding laundry and watching reruns of M*A*S*H.
Hope you had a great weekend as well, and perhaps found a mystery bottle in your wine fridge! 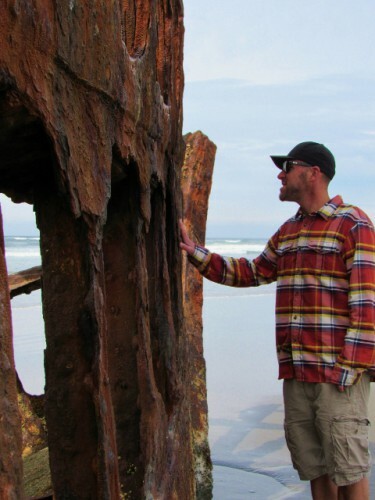 Oregon Coast 2015: Lewis and Clark Were Here! As I’m sure you remember, Lewis and Clark and the Corps of Discovery departed in 1804 from St. Louis on a two year mission to map the United States’ newly acquired territory, find a route to the Pacific across the continental U.S. and establish an American presence to prevent Britain and other European powers from making claims. 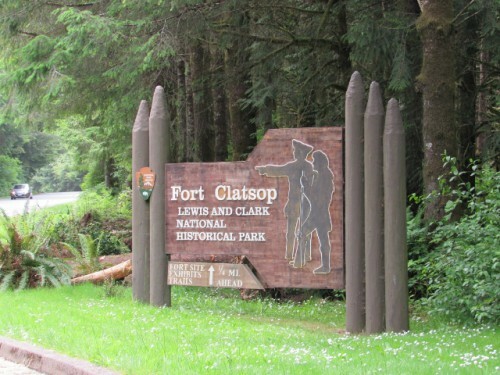 Lewis and Clark National Historical Park is located at the site of the 1805-1806 winter camp of the expedition, known as Fort Clatsop. In true Pacific Northwest fashion, it was a rainy winter. There were few dry days when the expedition was camped here. The group was able to prepare for the return trip the following spring, by creating a new stockpile of salt for preserving food, hunting and gathering other food, and trading with the tribes in the immediate vicinity. But the journals that exist from the period indicated that it was a claustrophobic, cramped, dreary time at Fort Clatsop. Many of the men came down with colds and the flu. Interestingly, the winter camp was originally on the other side of the river, in what is now Washington. However, the food sources were minimal there, as the elk had moved higher into the mountains. Moving the camp was discussed, and each member of the expedition was able to vote on the move. It is widely believed to be the first time a slave and a woman were granted the vote in American history. The expedition got on their way in March 1806 for the long trip back east. 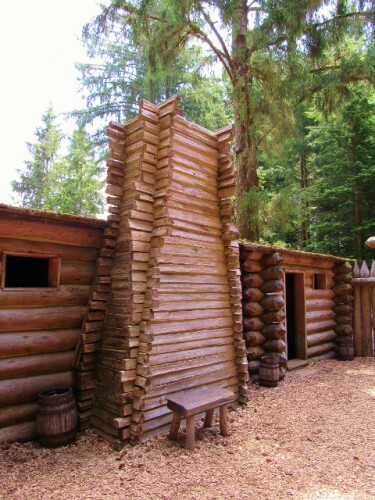 Fort Clatsop’s structures were given to one of the tribes and the fort was taken over again by nature. A replica was built when the site was designated as a National Historical Park in 1958. Sadly the replica burned in 2006; a replacement was built in 2007. The replica is thought to be historically accurate, having been built from sketches and descriptions that Lewis drew in his journals. 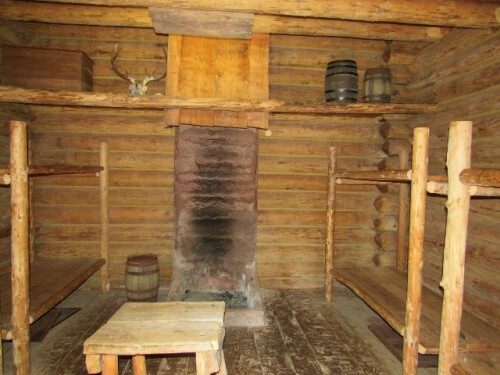 Living quarters for enlisted men – not much room! Although not one of the larger sites in the National Park System, it is unique in many respects. There are several sites that make up the historical park, which is a partnership between the federal government and both Washington and Oregon State parks. The original winter camp on the Washington side of the river is protected, as well as the site on the beach where the expedition made salt to preserve their food. Approximately 191,867 people visited the park in 2011. This particular site can be seen in about an hour – it is pretty surprising to see how they crammed over 30 people into such a small space. I can’t imagine the cabin fever of a cold, dark winter in that environment! We had one more stop on our drive home though – a mid-afternoon meal that would qualify as a very late lunch, or very early dinner. 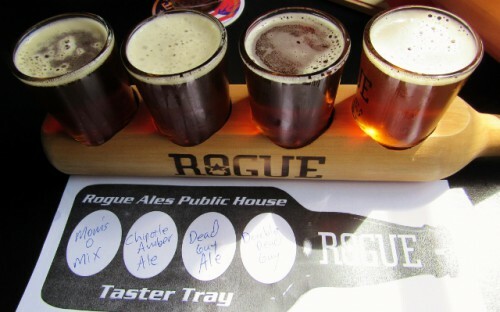 We went to the Rogue Brewery! I have never been to a brewery where they give you an appetizer sample of beer, but right after we sat down, our server brought out samples of their Morimoto Soba Ale. It was very unique, and delicious! When we ordered, I told our server what kinds of beer I like, and then let him pick the sampler I tried. I’d say he did pretty well. I tried the Mom’s O Mix, the Chipotle Amber Ale, the Dead Guy Ale, and the Double Dead Guy Ale. Jon of course had an IPA. For our meal, we split a bowl of their clam chowder – it was delicious! 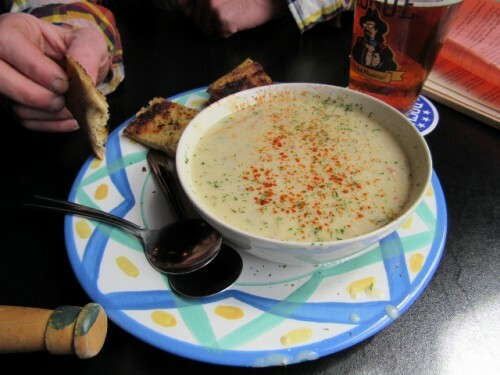 It was super-creamy with lots of chunks of clam, potato and celery and served with yummy bread. We also each had a salad. I loved the salad, but found that the dressing, a balsamic vinaigrette, was too acidic for me – it made my tongue raw! This has happened several times, so I wonder if I’m not just becoming too sensitive to the acidity in salad dressing. Fortunately, I don’t have the same bad luck with wine! 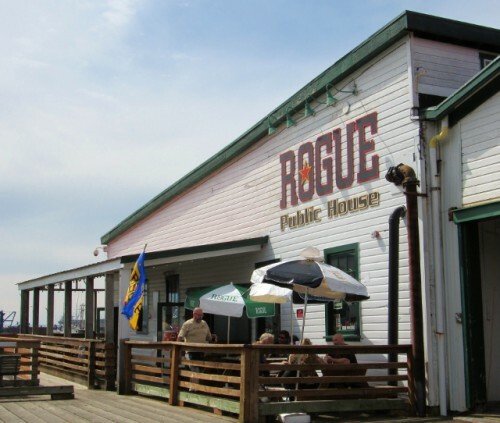 Rogue Brewery is located out on the pier in Astoria, which means you drive across an old, one-vehicle-width bridge onto the pier. It was definitely a strange experience! 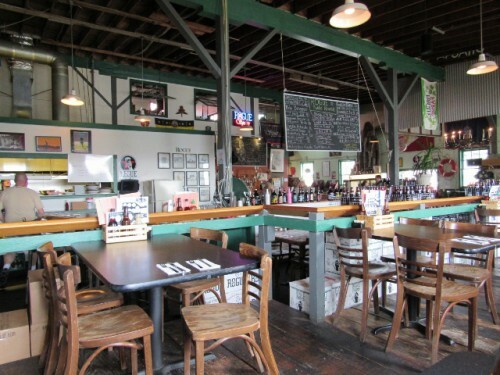 The brewery itself is located in an old cannery building, which they have tried to maintain in its historic state. The restrooms are mostly original, and require a walk through an old warehouse area which gives you a great view of what this building once looked like! 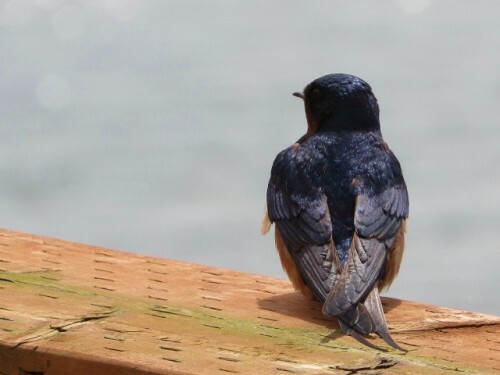 I also was able to get a few good pics of a barn swallow perched on the railing of the pier outside the window. It was a great place to have lunch! 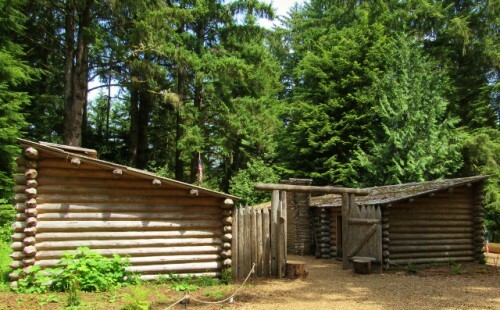 Have you ever been to any of the Lewis and Clark expedition sites around the country? The second night of our Oregon Coast camping trip, my Mom was kind enough to load me up with some warm blankets, and I was nice and toasty in my sleeping bag, which meant that I slept a lot better! Sunday dawned warmer too, so we hung out with the kids as they played on the playground. Shortly before noon we headed out to begin our long drive home, with a few planned stops along the way. Haystack Rock is an iconic sea stack jutting out of the ocean just off the beach in Cannon Beach, Oregon. 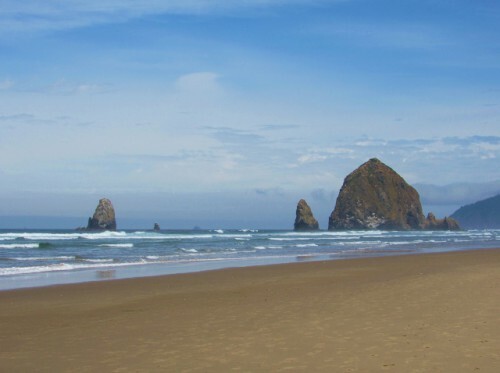 Although there are many other “Haystack Rocks” around, including three others in Oregon, this is the actual, real one… No really, I swear… You have probably seen it, even if you haven’t been here, as it was featured in the opening scenes of The Goonies, when the bad guys are trying to flee across the beach. It had been several years since I had been there, and Jon had never seen it, so we parked and strolled along the beach for a little while. It is still beautiful. From the beach, the Tillamook Rock Light is visible in the distance. It was completed in 1881, with a First Order Fresnel lens, and at the time, was the most expensive lighthouse constructed on the West Coast. The commute was so treacherous for light keepers that it became known as Terrible Tilly. It was decommissioned in 1957, and over the years, the wind and surf have eroded the rock, damaged the lighthouse and shattered the lens. It is now privately owned, and an unofficial columbarium. 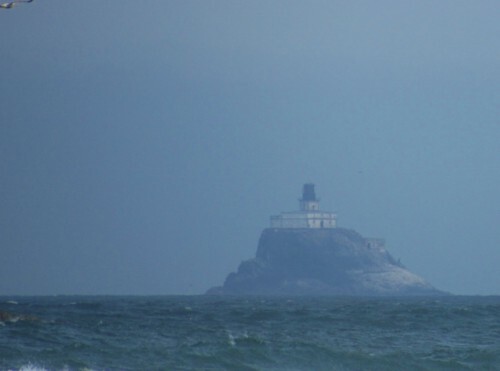 Tillamook Rock Light – built 1881. The Peter Iredale was a cargo ship that ran aground on the Oregon Coast, October 25, 1906, while it was en-route to the Columbia River. She was built in 1890, was 287 feet long and was made from steel plates on an iron frame. She was named for her owner, who also owned an entire fleet in England. She grounded during a storm, and a lifeboat was dispatched to rescue the 27 stranded crew and 2 stowaways. All lives were saved. Originally the intention was to tow the ship back into the sea, but after several weeks of waiting for good weather, the ship got ever more embedded in the sands, and she was ultimately sold for scrap. The bow, ribs and masts remained as a reminder of the wreck, and are now a popular tourist attraction. 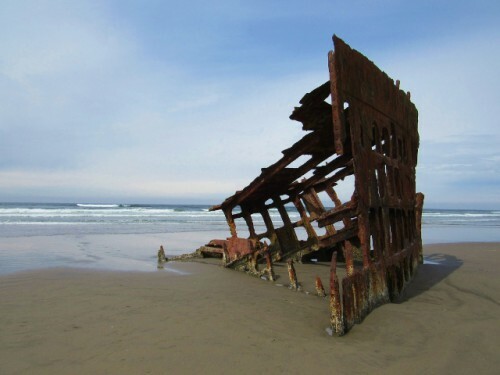 Interestingly, during World War II, Japanese submarines fired on the wreck of the Peter Iredale, so barbed wire was strung along the beach to hamper any planned invasion. The ship became entwined in the barbed wire and remained that way until the end of the war. 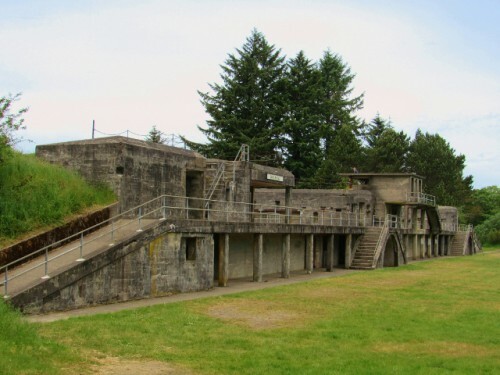 Fort Stevens was an active fort from the Civil War through World War II (although it wasn’t always manned), and had 3 batteries protecting the mouth of the Columbia River. Battery Russell was built between 1903 and 1904 and armed with two 10” disappearing guns. During the attack from the Japanese submarine, several shells landed near Battery Russell, but the order was given to hold return fire, and after 16 minutes of shelling, the submarine submerged and left. Did you know there had been a World War II attack on U.S. soil, other than Pearl Harbor? It would have been fun to tour the other two batteries, but I had more sightseeing planned for us! I love this wine. No, that doesn’t sound enthusiastic enough… I love THIS WINE! Jon and I tried it for the first time when we visited Anne Amie in 2009, and bought a bottle, even though it was a bit pricey for our budget at the time. Jon opened it one evening by mistake, when he thought he was opening one of their less expensive Pinot Blancs. Instant special occasion! It was fantastic, even if we weren’t planning to drink it that night. Fast forward to February, when we were at Anne Amie for their Bubbles Fest, a small wine festival with just sparkling wines from eleven Willamette Valley producers. Now that was a fabulous Valentine’s Day! When we were making our purchases from the festival, I asked the folks if they had any of the current release of Prismé, and they did! Untasted, I had them put one in the box. A few days ago Jon and I celebrated the 7th anniversary of the night we met, and to celebrate, I opened this bottle. Again, it knocked my socks off! The Prismé is made with some of their best blocks of Pinot Noir, and the juice is pressed and aged without the skins in French Oak Barrels on the lees for 18 months. It has aromas and flavors of apples and vanilla, and a long creamy finish with a light, yeasty, oak flavor. They are certainly doing something right with this wine. Fabulous! Have you had Anne Amie’s Prismé Pinot Noir Blanc? What did you think?